Is advertising art? It's an issue that has caused deep chips on the shoulders of many an agency creative who could never understand the disdain their work attracted just because it sold things. Yet, despite the intellectual snobbery adland was long forced to endure from the art world, the two have actually fed off each other for centuries. Sir John Hegarty likes to point to the decanter in the bottom right-hand corner of Titian's Annunciation that the artist included as an ad for the clear glass newly developed by the Venetians. And in 19th century Paris, Toulouse-Lautrec was an early convert to poster advertising, which so suited his artistic technique of bold lines and strong, flat colours. In the 40s, Norman Rockwell, then one of America's most famous artists, was happy to create ads for Jell-O and Orange Crush. Thirty years later, as creative constraints threatened to throttle UK cigarette advertising, along came the surreal Benson & Hedges Gold campaign with its echoes of Magritte. Indeed, it was those constraints that brought advertising and art together to create the 1983 Silk Cut campaign, one of the most iconic of that decade. The inspiration for it was the paintings of the Italian conceptual artist Lucio Fontana and the volcanically temperamental agency creative and art collector Charles Saatchi. 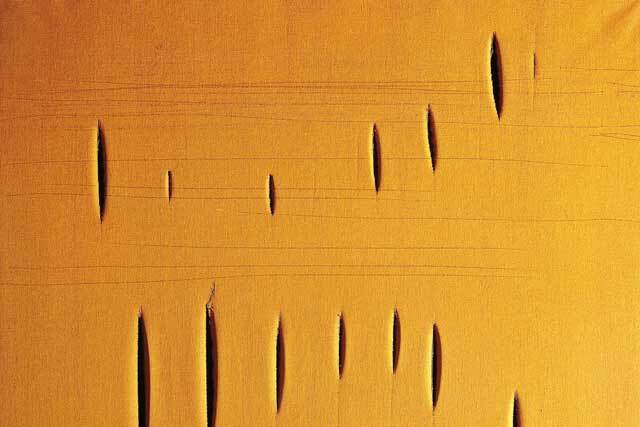 The Saatchi & Saatchi founder had acquired several paintings by Fontana, who, in 1949, began evolving his trademark style of puncturing and slashing his canvases. Saatchi was convinced Fontana's technique was the perfect fit for the agency's big-selling Gallaher brand. Paul Arden, then the agency's creative chief, later remembered how Saatchi told him: "Here is the next campaign for Silk Cut. Photograph it." Arden had grave doubts, but Saatchi brushed them aside. "When we pointed out that silk being cut was a concrete idiom, a visual pun that would not work in any other language but English, Saatchi would have none of it." Saatchi was proved right. The Fontana-inspired Silk Cut work, which had no copyline and used the brand's signature purple colour, became one of the cleverest poster campaigns ever seen in Britain. - Arden worked with five renowned still-life photographers to create the Silk Cut campaign. Later, he took the installation artist Christo as his inspiration by stretching a mile of purple silk across an American canyon for a cinema commercial. - Fontana insisted that his style was not an act of destruction but a way of freeing him from the traditional confines of the picture space. - His works can be found in more than 100 museums around the world. One, called the Teresita, sold for £6.7 million at Christie's in 2008. Fontana never saw the Silk Cut campaign, having died aged 69 in 1968.